Please note we are a private tour company operating in Belize. WE DON'T WORK FOR ANY OF THE CRUISE LINES. WE ARE A GROUP OF TOUR GUIDES THAT CAME TOGETHER TO OFFER OUR PRIVATE SHORE EXCURSIONS TO CRUISERS. WE OFFER STRICTLY PRIVATE SHORE EXCURSIONS FOR BELIZE CRUISE PORT. WE OFFER THE SAME SHORE EXCURSIONS THE CRUISE LINES OFFER AND MORE. WE ALSO OFFER OUR PRIVATE SHORE EXCURSIONS TO EVERYONE CRUISING ON OTHER CRUISE LINES. The Belize cave tubing and zipline we offer is designed to last approximately 5.5 hours. It includes a 50 minutes drive from Belize City. As we drive we will be narrating the history of Belize and it’s people.When we arrive at the zipline site we will have a short restroom break. After the break we will gear you up for the zipline tour. 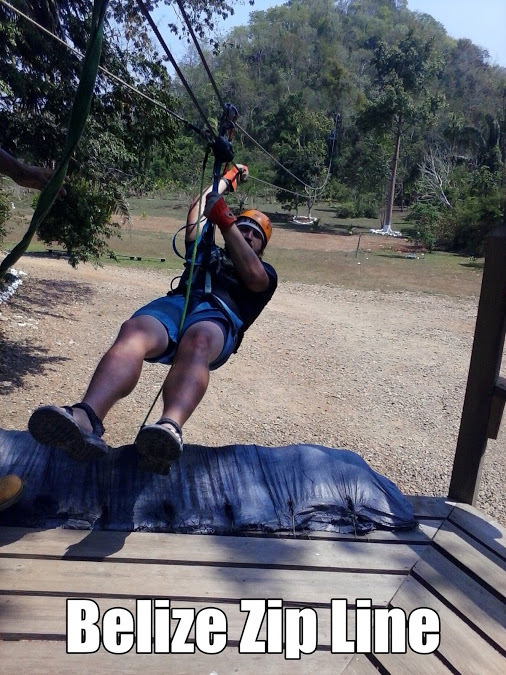 You will be zipping through the canopy of Belize’s rain forest for approximately an hour. You will also be zipping across a river. After the zipline tour you will be issued with a life vest, a inner tube, and a headlamp. We will then start a 15 minutes hike to the entrance of the caves. As we hike we will be doing presentations on fauna, flora, and the use of the caves to the Mayan people. The tour of the caves last approximately 1.5 hours. After the cave tubing tour we will be having rice and beans with chicken for lunch. After lunch we will be driving back to the place of tour origin. Kids need to be 40 inches tall to participate. 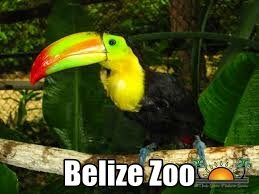 We will be passing the Belize Zoo whilst doing this tour. You can add the Belize Zoo to the day’s activity, All you need to do is pay your entrance fees of USD$15.00 per/ person. Whilst doing cave tubing and zipline we will be passing the Belize Zoo. You can add the zoo to the day’s activity. All you need to do is pay your entrance fees to the zoo ( $15.00 per/ person ) and we will do the tour of the zoo with you. We are not selling the zoo as a tour since we will be passing by. Please keep in mind that the prices of our tours may vary depending on the number of persons booking. This is because we offer strictly private tours. 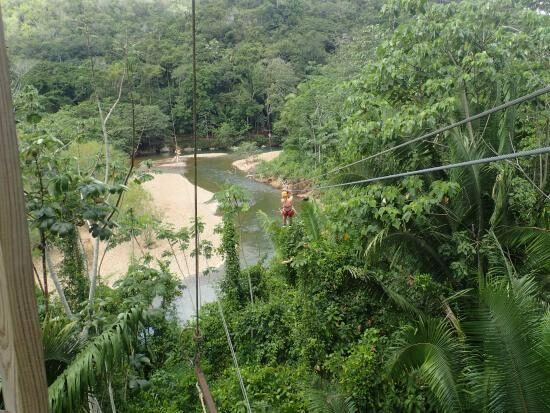 Belize Zip Line Canopy Tours – The thrill of the Belize Zip Line canopy tours is extraordinary; being as high as 100ft above the forest floor in the canopy of the rain forest is already an incredible feeling. You are literally in the habitat of birds moving as fast as 30mph. For those with a great adventure spirit this tour is highly recommended. Because this adventure is located within the cave-tubing park the adventure could be a great addition to your cave-tubing tour. It also could be done separately. It’s approximately an hour drive from Belize City on the western Highway. We recommend bringing along insect repellent, sun-screen and your camera of course. After arriving at the park you will be taken to the area where the tour is done which is a few steps from the parking lot. Your guide will then introduce you to the crew at the site to commence your tour. There are nine Zip-Lines that you will be moving on, all of different lengths and height from the forest floor. It will last about an hour or a little more if there is a large group at the site. Ask for the repelling if it’s available it could be the highlights of the tour. What a rush of adrenalin imagine being lower from as high as 60 ft to the ground with high velocity it’s hard not scream. All this is done with great control and safely. The crew is highly train and is professional at their job. They have an impeccable record and guarantees the best time of your life. From the young toddler to senior citizen this Zip-line adventure is possible for all to enjoy. It’s the perfect therapy for those afraid of heights come along dig deep you’ll be more than surprise of the great fun and excitement this tour entails and its all available here in Belize with us the adventure specialist A Plus Adventures Belize. The prices of our tour may vary depending on the number of persons booking. This is because we offer strictly private tours. 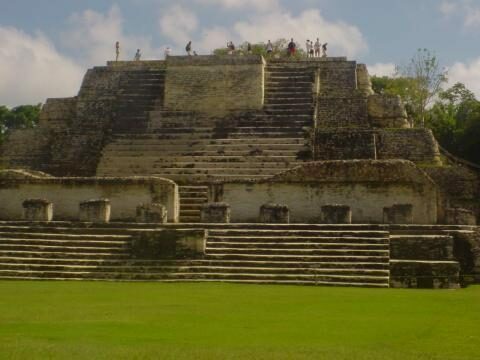 Altun Ha Tour begins with an enjoyable Belize City Tour, filled with interesting history and culture. You get an opportunity to see Baron Bliss Light House, St. John’s Cathedral, the Old Belize Swing Bridge, down town Belize City and even the Central Bank of Belize where the largest jade object found at Altun Ha is being securely kept within its chambers. As you continue North of Belize unto the old Northern Highway for approximately 19 miles you will arrive at the Old Northern Road, 14 miles from there you will arrive at the ancient City of Altun Ha tucked away inside the Jungle. While travelling through these local communities you will be enlighten on the funny reasons for their existence. Altun Ha Mayan Temples just 33 miles from Belize City was a small but surprisingly rich major ceremonial center occupied during the classic period. Walk through the same path of the Maya’s, amongst some of the mounds that have been partially excavated and restored by some of the locals and Dr. David Pendergast who did an extensive research from 1967 to 1974. Here in this city buried inside the Sun God Temple, which stand 54 feet from the plaza floor was where the largest carved jade object in the Mayan World was found as you travel back in time with history and feel the presence of an ancient civilization come alive; hike above some of its highest monumental structures where the elite families once occupied and enjoy a spiritual and panoramic view from above. Inhale the fresh air of the pristine green forest that surrounds you and soar with the spirits of the ancient Mayas that still preserves its pass. Your Guide will also be pointing out some of the local remedies of the rainforest used by the Mayans. Altun Ha is a City of over 500 mounds with approximately 15 has been excavated; the city is surrounded by the thick broad leave forest which holds the secret of the Mayan civilization. Altun Ha Temple has recently in 2014-2015 gone through some major upgrades including now a Wheelchair accessible restroom, a visitor center amongst other renovations. The plazas are flat and are wheel chair friendly. After the Tour of the 2 major plazas you will have the opportunity to shop some local wood crafts, which are hand made at the site. On the way back to Belize City we will be having lunch at a local restaurant, serving some tasty Belizean dishes. Then you will be making your way back to the departure point where your guide will ensure your safe and timely return. This tour is perfect for families of all ages. The Community Baboon Sanctuary a first of its kind where the locals designated themselves a wildlife sanctuary and adjusted the way of life for the environment. The Baboon Sanctuary is located in Bermuda Landing along the Belize River Valley and was started in 1984 by Dr. Horwitz a primate professor from University of Wisconsin. He was attracted to the area after seeing a documentary about a fig tree next to where there was a ferry in the village which supported 46 variety of birds and animals one of which were Black Howler Monkeys which returned to the tree everyday at sunset. After spending months in the village with the local Belizeans they came up with the idea to protect the Howler Monkey population which was a mere 400 at that time by not clearing land along the riverside, cutting down natural fruit trees, and leaving natural bridges so the howlers can travel in the trees. Now the population in the area exceeds 1600 monkeys. During the tour of the sanctuary your guide will point out important flora and fauna and will get you up close to Howler Monkeys in the wild. You will hear why they are one of the ten loudest animals on Earth. We have been doing cave tubing since it was first introduced in 1995. At that time we worked for Jaguar Paw, a resort and restaurant in the area that monopolized the cave tubing business for almost 5 years. Then the government opened a parking lot at Nohoch Che’en Caves Branch Archaeological Reserve, and private tour guides were allowed to use the site. Over the years we have learned a lot about the geological formations in the caves, though at first we knew little. We listened to archaeologists and experts who gave us valuable information. We learned how caves and the structures inside developed. We also learned how the river system worked, all very exciting, and every time we did a tour we learned something new. We explored the whole nine-cave Caves Branch River system. Knowing river conditions is essential for a good cave tubing guide. We have learned the critical things about the behavior of the river, especially when it rains. It is easy for a flash flood to occur during the rainy season, and it is very important to be knowledgeable about how the river can rise. At such times we do not go inside the caves. Safety is a major consideration on our tours. Also we never underestimate how swift the current can be when river conditions are affected by rains. Both the depth of the river and the direction of the current can change, and it can be dangerous. All our guides are licensed tour guides and are certified in first aid and CPR (cardiopulmonary resuscitation) as required. Each van has a first aid kit and a copy of the company’s emergency plan. We have become skilled at judging river conditions. After rains we are the first guides allowed to go into the area of the river and caves as the water recedes. We take a park warden with us so information about conditions can be passed on to the main office, where other people planning cave tubing can benefit. We have been doing this for several years. Our guides are very well trained, and most are in the caves every day, not just once a week. We stay aware of weather conditions, and when there are rains that flood the caves, we know it, though this does not happen often. When it does, we will offer alternate tours that we believe you will be happy with. 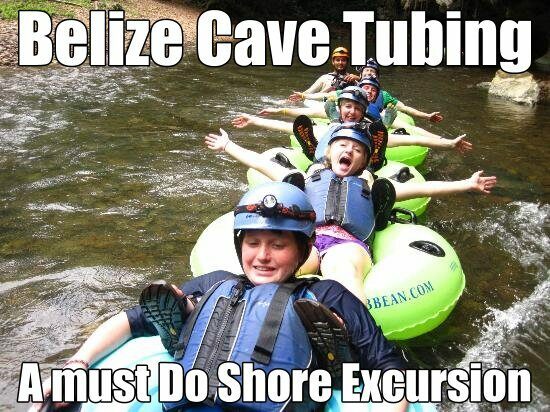 We believe people of all ages and most physical conditions can enjoy cave tubing. Parents can hold a child in their arms if they like, and we have small inner tubes and life-jackets for children. The important thing is that everyone feel comfortable and safe. If someone needs to go a little slower or have their inner tube carried for them, our guides will assist. No one is rushed. Our aim is to see that every one of every age can experience and enjoy this adventure. 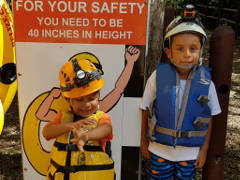 Note: Kids must be at least 40 inches (101.6cm) tall to go on the cave tubing tour with us . Visiting Lamanai is going on three adventures in one tour. 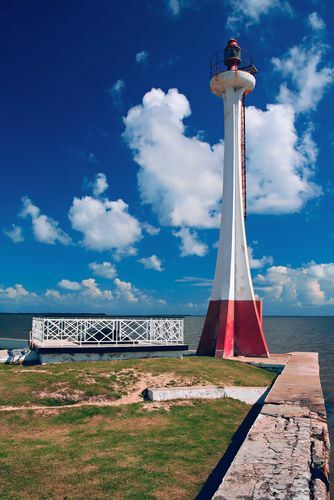 Your fun day begins at the port of Belize City, where you are transported in a comfortable air-conditioned van. We drive you through Belize City on to the Northern Highway where you get to see the countryside and learn about the culture of Northern Belize. Your guide will be pointing out important monuments and landmarks as we head towards the New River. You will arrive in Orange Walk Town also known locally as “Sugar City”, where you will board our boat that begins the wild life adventure up the New River. Your guides will highlight the wild life of the New River such as the spider monkeys, crocodiles, the variety of birds, and the flora and fauna along the New River banks. On arrival at Lamanai situated off the New River Lagoon, you will be treated to a delicious Belizean buffet-style lunch of Rice & Beans, potato salad, coleslaw and fry plantain. Be sure to try out our spicy “hot” tomato habanero sauce. You’ll have a choice of an ice-cold soda or water, and the meal includes tropical fruits for dessert. After lunch, we make a start hiking to the temples of Lamanai and while on the path we’ll be looking out for the Howler monkeys and the colorful Toucans that are predominant in the area. As we arrive at the Lamanai Mayan ruins you will get to look at the Mask Temple, the High Temple, the Ball Court, the residential area and the Jaguar Temple. Your guide will give you detailed information on the historic significance of each area, and you will get the opportunity to climb up the High Temple via the original stairway built by the Mayas, and get a spectacular panoramic view of the lagoon and the surrounding jungle. For cruise ship customers, we will pick you up at the port of entry and get you back with lots of time to spare. This tour is a full day activity. This includes a an hour drive to the Ranch where the horseback riding is done. We will will cross a river in a boat to reach the ranch. When we arrive at the ranch we will have a short rest room break. After the rest room break you will be briefed about the nature of the tour. The horseback riding last approximately an hour. After the horseback riding we will drive 20 minutes to the zip line. When we arrive at the zip line you will be assisted with your gears. The zip line part of the tour last approximately an hour. After the zip line we will drive 10 minutes to the caves. You will be issued with life vest, inner tubes, and a helmet. You will then hike approximately 20 minutes to the entrance of the caves. The cave part of the tour last an hour and a half. After the cave tubing we will drive drive to a nearby restaurant for lunch. Lunch for the day is rice and beans with chicken. This tour is designed to last approximately 5.5 hours. It includes a 50 minutes drive through the countryside to the Mayan Ruins of Altun Ha. As we drive through the countryside, we will be doing presentation on Belize History, Ethnic Groups Of Belize, and Pointing out sites of interest. Upon our arrival at Altun Ha Ruins we will have a short restroom break. 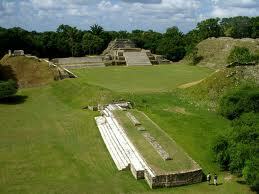 After the break we will start the tour of Altun Ha Mayan Ruins. The tour of the ruins last approximately an hour. 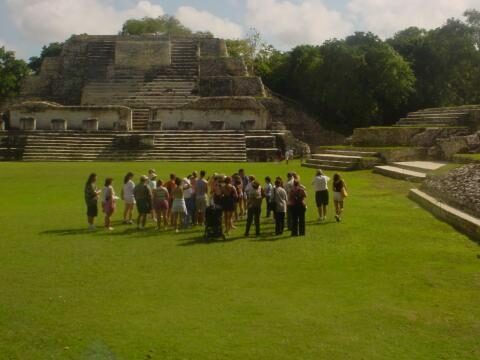 As we go through the site, we will be doing presentation on Medicinal Plants, Indian History, and Altun Ha History. After the tour of Altun Ha Mayan ruins we do a slow drive to The Baboon Sanctuary. The tour of the Sanctuary includes a short hike through the rain forest in search of Howler Monkeys in their natural Habitat. 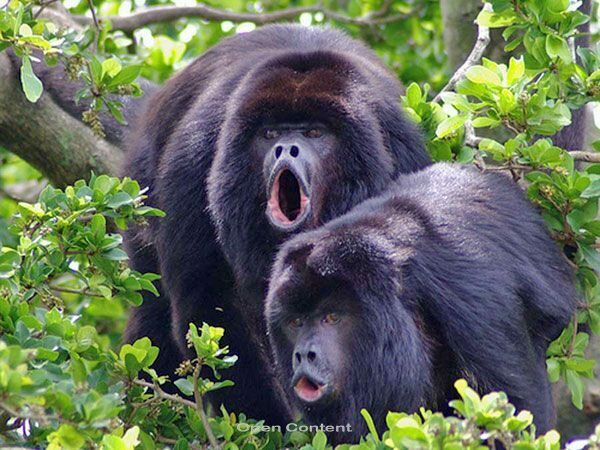 You will get an up close view of the Howler Monkeys. You may also hear them howl. After the tour of the Sanctuary, We drive back to Belize City. 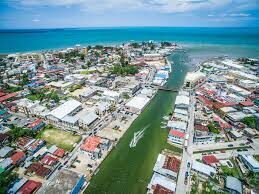 When we arrive in Belize City you will be offered a complimentary tour of Belize City and you will get the chance to see some of our Historical Sites. You can also stop to shop, or have lunch if you like. Group of 4+: $100.00 per person with lunch. Belize Cave Tubing and Belize Zoo - This tour is designed to last approximately 6 hours. 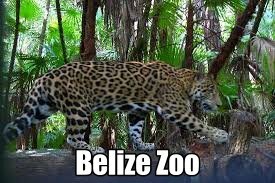 It includes a 40 minutes drive from Belize City to the Belize Zoo. When you arrive at the zoo we will have a short restroom break. After the break we will do a slow walk through the Belize Zoo. The tour of the last approximately 40 minutes. After the tour of the zoo we will drive approximately 20 minutes to the cave tubing park. When you arrive at the cave tubing park we will have a short restroom break. After the break you will be issued with your gears for the cave tubing part of the tour. You will be hiking through the rain forest to the entrance of the caves. As we hike we will do presentation of Medicinal Plants, Fauna, and the use of the cave to the Maya. Before you enter the caves, you will be instructed on what to do and what not to do. The cave tubing part of the tour last between an hour and an hour and a half depending on the current of the river. After the cave tubing tour we will change in dry clothes and head to a local restaurant for a local dish of rice and beans with chicken. Belize Zip Line and Belize Zoo - This tour is designed to last approximately 5 hours. It includes a 50 minute drive from Belize City to the zip line site. As we drive to the zip line site we will be narrating the History of Belize to you. When we arrive at the zip line site we will have a short restroom break. 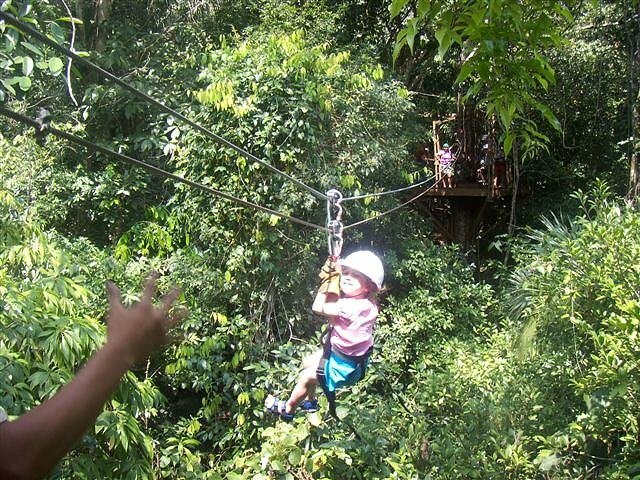 After the break we will gear you up and start the zip line through the canopy of the rain forest. The zip line part of the tour last between 40 to 50 minutes. After the zip line tour we will drive approximately 20 minutes to the Belize Zoo. We will have a short restroom break upon request. We will then start the tour of the Belize Zoo where you get the chance to see some of Belize’s wildlife in their natural habitat. The tour of the Belize Zoo is a slow paste tour. It last approximately 40 minutes. After the tour of the zoo you will be dropped off at your hotel, Belize Cruise Port, Or at the Water Taxi. 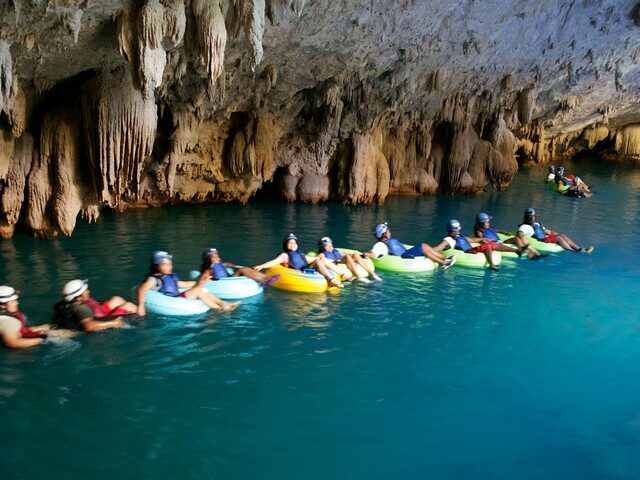 The horseback riding and cave tubing is designed to last approximately 5.5 hours. This includes an hour drive from Belize City to rain forest where the horseback riding is carried out. As we drive to the rain forest we will be narrating the history of Belize and its culture to you. When you arrive in the rain forest, we will having a short rest room break. After the break you will be given instructions on how to comfortably control the horses. The horseback ride last approximately an hour. After the horseback riding we will drive approximately 25 minutes to the cave tubing park. When we arrive at the cave tubing park we will be having a short rest room break. After the break, you will be issued with headlamps, life vests, and an inner tubing. We will then start a 20 minutes hike to the entrance of the caves. The cave tubing part of the tour last approximately 1.5 hours. After the cave tubing we will drive to a local restaurant where you will be served a local dish of rice and beans with chicken. The horseback riding combined with Belize Zoo is designed to last approximately 5.5 hours. This includes an hour drive from Belize City to rain forest where the horseback riding is carried out. As we drive to the rain forest we will be narrating the history of Belize and its culture to you. When you arrive in the rain forest, we will having a short rest room break. After the break you will be given instructions on how to comfortably control the horses. The horseback ride last approximately an hour. After the horseback riding, we will drive approximately 30 minutes to the Belize Zoo. When we arrive at the zoo, we will have a short rest room break. After the break we will do a slow pace tour of the zoo where you get the chance to view some of our native wildlife. The horseback riding combined with Jungle A.T.V. is designed to last approximately 5.5 hours. This includes an hour drive from Belize City to rain forest where the horseback riding is carried out. As we drive to the rain forest we will be narrating the history of Belize and its culture to you. When you arrive in the rain forest, we will be having a short rest room break. After the break you will be given instructions on how to comfortably control the horses. The horseback ride last approximately an hour. Cruise ship passenger are asked to be off your ship as soon as possible. When you are off your tender, please go to Terminal #1 and exit from the main gate. Take a right turn and walk to the Light House. The walk to the Light House last about 2 minutes. We will be there with a sign that reads your name. Below is a picture of the Light House. As you are being tendered to the Cruise Port; you will see on the right hand side of your tender.